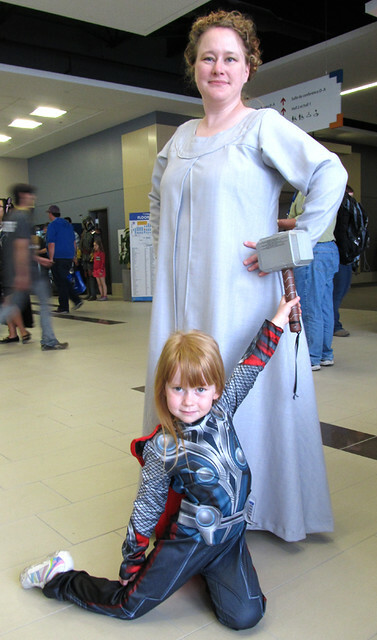 A reader named Anna contacted me about the Frigga costume I made for Ottawa ComicCon way back in 2013, wondering what pattern I’d used and adaptations I’d made. I originally posted about it back in my LiveJournal days, so I had to search around a bit for the old text and photos. But here it is, what little I wrote down. 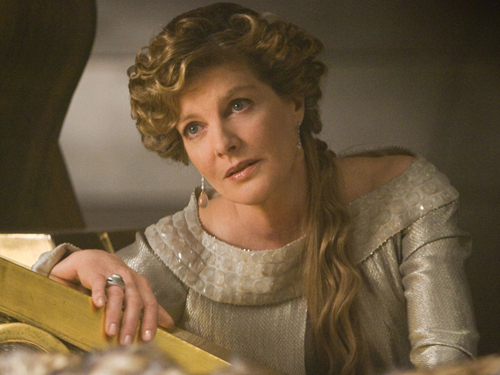 I hope it helps Anna, as well as anybody else who intends to dress up as Frigga in the future! 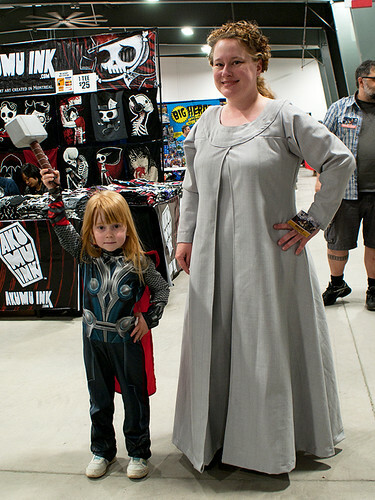 The costumes in question: me as Frigga and Thing 1 as Thor. It was Thing 1’s first Con. Um, whoops. In my defense, my house is still up for sale and I didn’t want to create a massive crafting mess in anticipation of showings. However, things got down to the wire on the Monday (I planned to wear the costume that Friday), and I started getting things ready, showings or no showings. 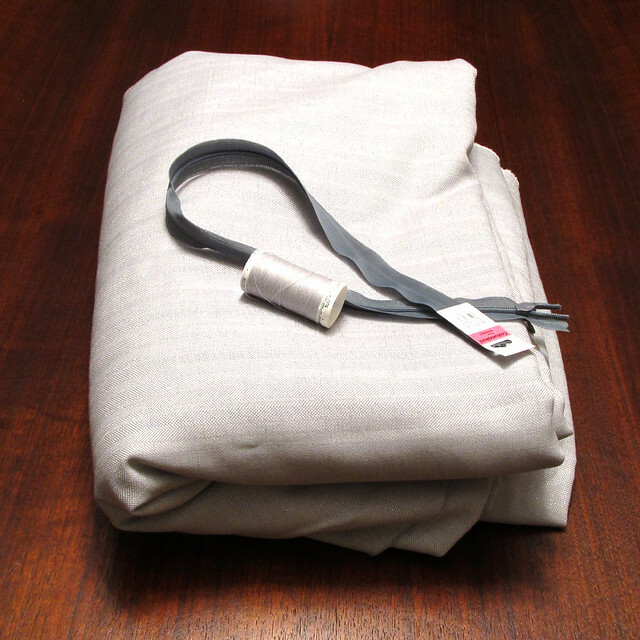 Fabric, check. Notions, check. Pattern, check. Sewing machine… Crap, where did I put it? After going through every closet and the disaster that is my garage/main storage, it turns out that I’d given it back to my mom while I was showing the house (mine needs repairs). Which I discovered Monday night, too late to do anything about it. I picked up the machine Tuesday morning and started on the costume during Thing 2’s nap time that day. Screen shots from Thor (2011) © Paramount Pictures; used under fair use laws. Note from the future: I never did get around to doing that. The dress stayed as you see here. “Oh yeah, and the hair? Mine. My mom put it up for me in rags the night before the con and I styled it the day of. And yes, I did have people who knew who I was supposed to be. Not many, granted, but some of that was just because I was dressed as a supporting character. And I’d go as Queen Elinor, but she refused.Given the option to pretend to be a super hero or a princess, she chose a super hero. 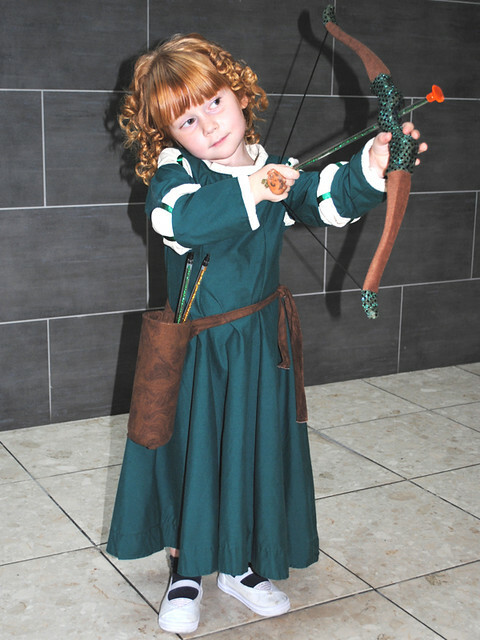 I don’t blame her, really, except that Merida is by far my favourite Disney princess. 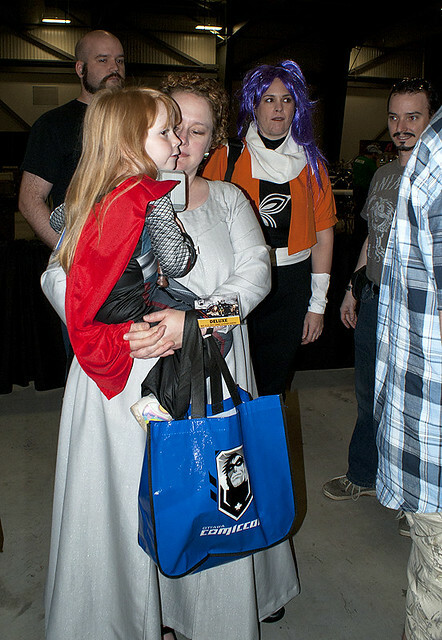 Thing 1 was a little shy at first, ComicCon being a big place filled with lots of strange adults, but she got into it pretty quickly. 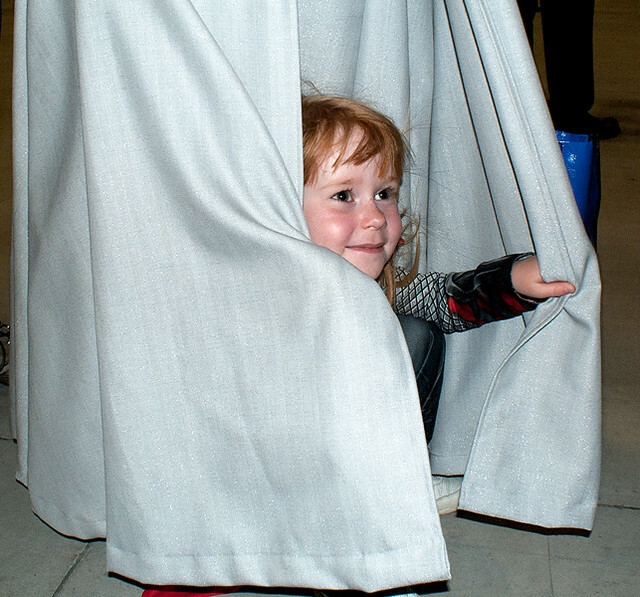 When talking with her uncle about the con, she summed it up as, “And I saw Batman and a Storm Trooper and R2D2 and Spider-Man and everyone kept taking my picture because I am adorable.” Yes, people kept telling her that and asking to take her picture. Despite all of my hard work, it was Thing 1 that ended up in the online edition of the newspaper that year, in her clearance-section Walmart costume. Ah well, it just goes to show that the provenance of your costume doesn’t really matter, so long as you’re having fun cosplaying. Also, when you’re four years old, you’re inherently much cuter than any adult and hence bound to steal the spotlight.